How does the W8 work? A turntable has a few key jobs. First it needs to spin a record at an accurate and consistent speed. Second, it needs to minimize the transfer of vibration into the cartridge’s stylus. Vibrations can come from belts that pull and release the platter countless times through the duration of a record. They can also come from the turntable’s motor passing vibration energy into the table’s spindle which would be picked up by the cartridge’s stylus. 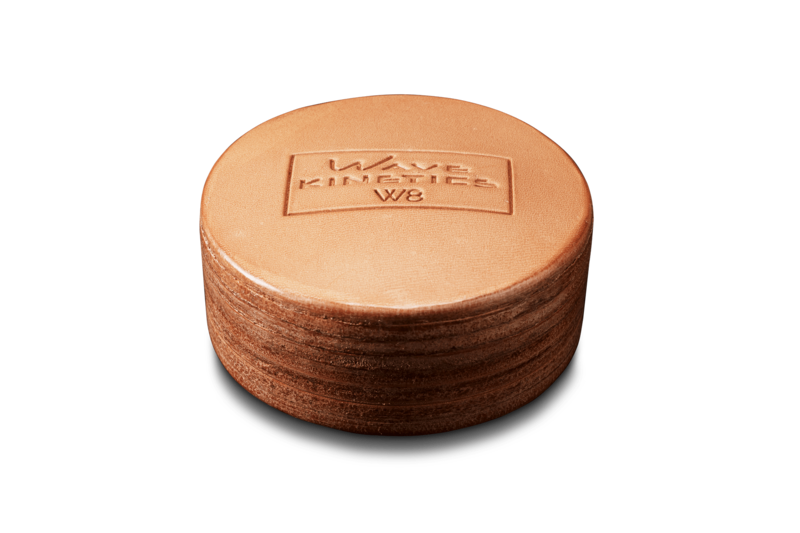 The WAVE KINETICS W8 Record Weight is the best way to control and eliminate these vibrations. The W8 combines the amazing visco-elastic properties of leather with cutting edge vibration attenuation techniques. The leather exoskeleton, which is hand crafted by world-class artisans using the finest Herman Oak leather, interfaces with the extremely soft and compliant retaining structure. Leather is an amazingly effective vibration absorber. Elastin, a highly elastic protein arranged in a unique nano-scale structure, allows leather to return to its original shape after being distorted, stretched or vibrated. The micro-structure of cow leather is a layered, complicated network of fibers of different sizes, from a few, to hundreds of nano-meters in diameter. They show nonlinear stress-strain relations and visco elastic behavior. This visco elastic property is what gives human and animal skin its ability to return to its original shape after being poked or pinched. This makes leather one of nature’s finest vibration absorbing materials. A thin layer of leather acts as a very effective vibration absorbing and transmission reducing material. The effect is easily visualized by thinking of wearing leather gloves while using a lawn mower or driving a car. In both cases, you feel an order of magnitude less vibration with the gloves on. The design of the interior combines tuned mass damping, particle impact damping, constrained layer damping, surface interface damping, and dissipation factor construction. Through the tuned mass damping mechanism, the W8 adds mass to a record and record platter. By adding mass the turntable’s susceptibility to vibration is greatly reduced and increases rotational inertia, but that is not really enough. Through the particle impact damping mechanism vibratory energy is removed through losses that occur during the impact of granular particles which move freely within the boundaries of a cavity attached to a primary system. Through the constrained layer damping mechanism a relatively thin, low-mass damping layer is constrained between the surface to be damped and a stiff counter layer, so when the surface vibrates, the mechanical energy turns into shear forces between the two and is dissipated in the constrained layer as heat. Through the surface interface damping mechanism, the exterior leather, which is soft and compliant, conforms to the record as well as to the turntable’s spindle. The W8 is designed to be totally customizable and form fitting for your turntable’s spindle. When you receive your Wave Kinetics W8, you will see instructions to wet the spindle receptacle with a Q-tip and place it on the spindle for approximately four hours. Wetting the leather acts as a plasticizer and relaxes the collagen chains; this allows the spindle hole to precisely conform to the diameter and shape of the spindle. When the leather dries it regains the original nano-scale collagen and elastin damping properties. Dissipation factor expresses a material’s ability to convert vibration or motion in one direction to shear forces in another direction and dissipates those forces as heat. The higher the dissipation factor, the greater the vibration is controlled. The W8 also slightly increases rotational mass. Rotational mass is a measure of inertia, of how easy or difficult it is to put an object in motion or to bring it to rest. The reason this helps is due to Newton’s First Law – An object in motion, remains in motion unless acted upon by an outside force. The result is better speed accuracy. When using the W8, contact is made over a large amount of the record label’s surface. Almost ten square inches of contact area, as close to the playable surface as possible, is covered. 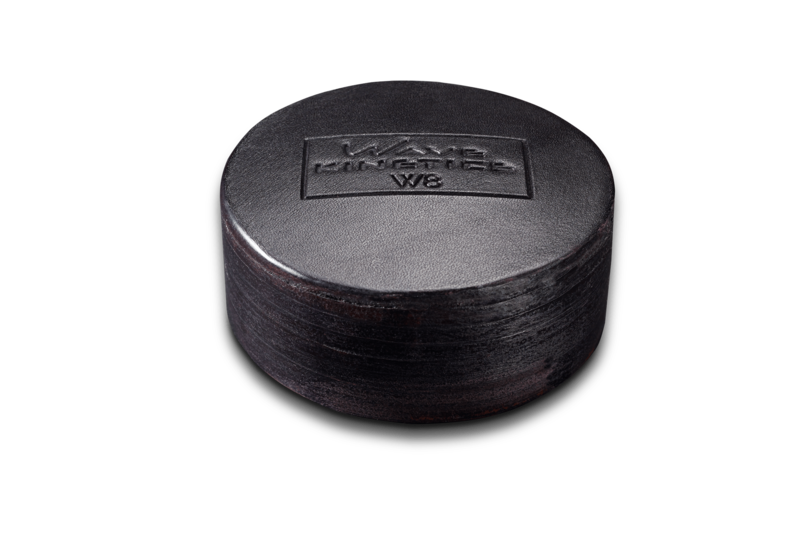 The large contact area creates an effective path for energy, or vibration transmission into the W8. What are the benefits of using the W8? As you can see from the images above, the image on the left (first image) is without the use of the W8 and the image on the right (second image) is with the W8. This measurement was taken playing a 315 Hz tone. Notice the reduced noise and cleaner primary signal. Similar results occurred at every frequency tested. The result is a reduced noisefloor with translates to an increase in signal to noise ratio. The high dissipation factor of the Wave Kinetics W8, and the excellent surface interface and surface damping combine synergistically to radically reduce the transmission of vibration to the cartridge as well as absorbing vibration generated by the turntable itself. This translates to a dramatic improvement in sound. It is almost like listening to the difference between CDs and records. You will experience an increased sense of stage, pinpoint accuracy and placement within the sound field, and hear greater clarity and detail retrieval, with much more control especially at louder listening levels.